How many times have you visited a Web site and been greeted with one of those automated agents looking to engage you in “conversation”? Or encountered a pop-up or display advertisement mysteriously linked to something you just bought or were researching? Conversion tools of this nature aren’t exactly new, but they are becoming a whole more targeted and sophisticated. One recent example I’ve come across is Fanplayr, which applies an additional layer of analytics to gather even more insight about visitor intent with the goal of being even smarter about how those people are approached. Here’s how Fanplayr’s service works: it analyzes where the visitor originates, his or her history and other behavior such as how long someone stays on a page, how deeply they dig into product details, and whether or not they seem to be doing some comparison shopping. It uses that information to create unique profiles that can be targeted with unique messages. Fanplayr is very much the opposite of “spray and pray” types of campaigns. “When you hit a reasonable number of those uniques, we can make a big difference in conversion rates,” he said. To be clear, if you’re a really small e-tailer or e-commerce merchant that doesn’t see all that much daily Web traffic, this solution probably isn’t for you. Where the service is really targeted is at midsize companies that are trying to capture more of their particular niche. One example is Seattle Coffee Gear, which sells exactly what its name suggests. 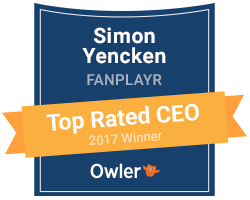 The company used Fanplayr’s service to develop visitor profiles and associated campaign and promotional offers. For example, a “persuasive discount” was shown only to those visiting specific product pages. Other visitors were targeted with discounts tiered according to the amount of time they spent on the site. The company explicitly excluded low-margin products from any sorts of offers. To test whether or not its offers were working, the e-tailer set up a control group – visitors that normally would received the sorts of offers described above, but that it deliberately left out. During a trial phase, Seattle Coffee Gear reported a 14 percent higher conversion rate among visitors targeted with the offers. The order values were also 30 percent bigger than for the control group. Fanplayr pricing starts at $49 per month; the company is in the process of creating additional self-service plans appropriate for smaller retailers, Yencken said. The technology can be integrated with a range of wildly used shopping cart technologies including Magento, Shopify, Bigcommerce and PrestaShop.